Fri, 4 Mar 2016 at 10:42 p.m.
A preliminary, a disclaimer : Your correspondent is not Ms Ali Jones, or Felicity Ferret ….and is cut to the quick by such a comparison. (Well he isn’t actually sure who Ms Jones is but won’t let that get in the way of a good line). However, readers, he would never be so careless with the financial facts that affect Dunedites. On a more serious note (unusual so early in a CD post), your correspondent has been shaken to the core with new information that has come to light in the last 2-3 days. By now you know the prerequisites : Strong tea, macaroons, and a big saucer. And today, some pepto-bismol. You will feel VERY queasy after this one. Our correspondent has jump started the Delta long reach excavator and quickly unearthed a massive SOFT SPOT in Delta credibility. Delta and the DCC are going to lose a lot of ratepayer funds at Noble. There is no happy ending, no handsome prince to kiss and revive Delta to financial health, where their $14.6M (11.3M + 3.3M) core debt will be paid. There is no bona fide mortgagee sale. Let’s consider the statements of the DCC Group Chief Financial Officer at the full council meeting of February 22; he told the council there was no “relationship” between Delta and Gold Band Finance, the Noble First Mortgagee. Well now, that would depend on how one defines a “relationship”. In our modern world, it’s all about equality, having an equal voice in all matters. Both parties, facing the future, hand in hand, etc. And yes, by those rose tinted soft focus lights, no, there is not a Delta / Noble “relationship”. What there is, is a dictatorship. Gold Band will do whatever Delta say. This is in writing. It is in a thing called a “Partial assignment of Debt and security sharing deed”, and commits Gold Band to servitude to Delta. And readers, you can check for yourself the claims your correspondent makes about this document. The document is posted right here, below. Although there is no reason to doubt –-your correspondent does not work for Delta…. It is Delta that are behind the “mortgagee sale” of the Noble Subdivision. Well and good, readers may say, we like that Delta are in control, and that fine Mr Crombie is steering the good ship Delta out of troubled waters. Really ? This correspondent thinks the ship is being steered…. straight into the High Court. Your correspondent has been advised that a court action against Delta for CONSTRUCTIVE FRAUD (stress ! rattling cups !!) is imminent, from a party to the subdivision, due to this “security sharing agreement”. This party has an “interest in the land”, in that the land is part of the same subdivision consent as that party’s subdivision. It was part of a complicated deal where parcels of rural land were sold by the effective parent of NIL, Apple Fields Ltd, who then had the right to buy back the 3.2 Hectares of each of the 4 Ha parcels of land from the new owners…. and for the amazing sum of $10 each, but only if and when NIL had gained rezoning and resource consent for the subdivision and for the consideration of the Owners’ inclusion in the subdivision. The terms were generous to NIL : They had a full 20 years to achieve this result before the buy-back provision was terminated. The Owners of each of the 4 Ha lots then got to retain 0.80 Ha (8000 m2) that they could then subdivide at minimal cost as the infrastructure was all in place for them, paid for by NIL. NIL’s side of the deal included an irrevocable commitment (in the sale and purchase agreement), to providing a vested road, full services and stormwater systems to the Owners’ remaining 0.8 Ha parcels of land. That was the deal that was signed. And a deal that remains, unfulfilled, 13-14 YEARS ON…. Readers, and our torporific Delta Directors (who could well be learning all this for the first time), should reflect on how incredibly dodgy this deal put together by NIL all is. (However Delta Management were fully aware and up to their ears in it). Let’s see : An entire 304 lot subdivision was being developed by a developer who didn’t own the land, having sold it off in parcels, realising we understand about $3M from the sale of those lots. They then soon after borrow $1.75M from Gold Band secured by the rights to purchase this land as above, for who knows what. It can’t have been to pay in full the Surveyors, Cardno, as they have a security over some land for monies owed as well. Then in 2008, well before the Resource Consent is issued in May 2009, NIL approach the land owners to transfer 25 Ha of the 40 Ha by way of the above payment of $10 per lot. This was before the Resource Consent is issued. The neighbours, fatally, agreed to this transfer “in good faith of the roading and services to come for the imminent Resource Consent”. Gold Band then registered their existing $1.75M loan as a first mortgage (which as noted in an earlier post, grew to $4M by 2013), against all those lots at the time of the transfer, before NIL had done any of the promised work. The developers NIL, then reneged on all of their irrevocable commitments, did not build the road, and undersized all the stormwater drainage system that the road was meant to hook into. This means that huge parts of the stormwater drains (laid underneath the freshly laid asphalt, and +2m deep) will have to be dug up and re-laid, to fulfil commitments to the neighbours. As a (half) competent civil contractor, Delta would have known the system was undersized but kept silent. NIL however didn’t keep silent. They continued to “assure” the residents the opposite. That their roading and subdivisions requirements inclusive of this stormwater provision were being provided for when they weren’t. NIL still needed the front part of the residents’ access lot for their own access and commercial area, so needed to keep assuring them they were provided for. NIL tried to entice the residents to transfer this further land, again ahead of promises for the considerations yet to come, but the residents by then had become weary. There was no need for this further transfer in advance of the promised road and services. The residents didn’t find out until four years later that their stormwater provisions had never been provided for, neither in applications or physical works, and that their promised road and subdivisions had been made impossible before they transferred their 3.2 Ha of land in consideration for these. There has been years of litigation between the neighbours, NIL, Gold Band, over this and other matters. The lesson from this dismal tale is tread warily of Christchurch Private School Old Boys bearing the gifts of free subdivision work. The revolutionary disregard for the normal and necessary strictures of commerce, district plans, engineering standards, NZTA safety standards, the rule of law, would make Ayn Rand blush. Delta have worked very hard to find the single most dysfunctional subdivision deal in Christchurch. (And probably beyond). But readers, our concern is not the dismal NIL. Delta were their henchmen, and were complicit with them every step of the way once they started on site. Delta had found a new friend. Delta were the tri-axle (tri-hard) trailer to the NIL tractor unit, to put it in earthmoving terms. Dunedin Ratepayers are paying for many years of child support for this failed romance with a deadbeat. 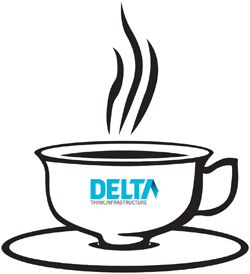 The onsite Delta team were acutely aware of the problems. At one point the site manager went to Delta Management to explain that the neighbours problems could be resolved by building the road NIL owed them as part of the subdivision, which he could whip out in less than three months. Presto, the caveats would come off, everyone would win. Delta Management told the site team to take a hike, they had “gone too far” and were “too close” to the neighbours. After that, the neighbours had offered to remove their caveats on the titles for the benefit of all parties, provided their road and services was assured in the first stage of vesting as required by their contracts. The single condition being that Delta would guarantee to the neighbours that they would build the road. A memorandum of understanding (MoU) that was drawn up even provided that NIL would provide an all important first mortgage security of $900K for Delta for this work. Delta refused to sign it. Delta yet again, enabled NIL’s despicable behaviour. Delta worked with NIL to circumvent or defeat the neighbours’ interest at many points. Yes readers, I know you are restless, I can hear your complaints, “get to the point, we are only interested in Delta and their debt ! (and their stupidity). The kicker to this story is that there was light at the end of the tunnel. Last year, the neighbours offered to buy the first mortgage at full value from Gold Band to avoid the court action over the caveats that Gold Band wanted removed in the event of a mortgagee sale. Gold Band were keen to do business. But Gold Band were not allowed to sell ….because Delta would not let them under the terms of the security sharing deed. This is the cause of the action for constructive fraud that is imminent. The reason Delta will very likely be found liable is from the precedent set in a case called Instant Funding vs Greenwich Property Holdings Ltd HC Auckland CIV 2007-404-6806, where the factual narrative is exactly the same : A finance company, sought a mortgagee sale of a property. A party who had carried out extensive improvements, and clearly had an interest in the property, offered to fully repay the first mortgage. The first mortgagee agreed, but was then “influenced” by another party not to deal with the person that had a vested interest in the property but to sell to another party instead. (Memo To Delta : Get some better lawyers : This Correspondent is getting tired of providing you with legal and other advice for nothing ! Unlike Delta, he doesn’t think working for nothing is a business strategy). Delta cannot “influence” Gold Band by way of insisting that they refuse to deal with a party who has an interest in the land that ranks ahead of them, just because they want to protect their (enormous) lower ranked securities. However, the security sharing deed goes beyond “influence”, it “requires” Gold Band to do as Delta instructs. The security sharing deed was drawn up by Delta’s own lawyers —and NIL, Gold Band and Delta are all parties to it. The whole agreement was prepared, it appears, to attempt to defeat the caveats that ranked ahead of them. The caveats are specifically mentioned in the agreement. This would make the deed null and void, unenforceable. It would also be an abuse of power by a Local Government entity to enter into an investment and then attempt to defeat the prior known interests of private citizens in it. Who wrote these @&#!! deeds you ask ? Who has made Delta’s precious security very likely unenforceable ? Delta’s lawyers of course. And lawyers only write into deeds what their clients tell them to write, and in this case also what NIL and Gold Band apparently wanted them to write. Further proof of Delta’s profound stupidity : a) Your correspondent has been advised that one of the Delta second mortgages is not even a registered mortgage but merely an “agreement to mortgage” and therefore Delta’s “security” that Mr Crombie crows about is a lot less certain than he would have us believe. b) It appears the Delta second mortgage and their further credit advances provide that the debt will be repaid from section sales. There is no time limit, or other restrictions, so now, into its seventh year, with no payment on the mortgage at all, the mortgage is still not in default. Finally : Let’s look at this mortgage security, and what it reveals about NIL’s intentions. Mr Crombie and Mr Cameron have long reassured ratepayers they have security. NIL, for the $1.75M Gold Band first mortgage, gave security to Gold Band over 9 titles of land, ie with a total of 25 Ha. On the other hand, Delta were given security for a $5M second mortgage, over just 1 lot of 3.2 Ha. Hmm : 25 Ha for $ 1.75M for their favoured financier : 3.2 Ha for $5M to the desperates at Delta. That is a Friends : Fools security ratio of 22 : 1. Apparently, there are some cunningly inserted words that make it appear there is a priority swap from Gold Band to Delta over all the land, but a closer reading will show that it is limited to just Lot 14. As noted, numbers, counting and reading comprehension are all problem areas for Delta. These failures are very likely to have consequences of epic proportions for Delta. No amount of running around by ex Delta Director Mr Mike Coburn (yes he has been involved, no time tonight to go into that mud pit) is going to change a (highly likely) illegal deed into an enforceable one. Your correspondent wrote in an earlier post that Delta were too stupid/ dense/ naive to realise that when they began to act in concert with NIL to defeat the interests of the neighbours, alarm bells needed to ring. A developer that would “clothesline” or ignore its commitments to one party would have no hesitation doing the same to their cling-on contractor…. NIL and Gold Band are not Delta’s allies. The awful truth is surely beginning to dawn on Delta. They’ve been given the static clothesline. What is the way forward now ? Your correspondent is horrified by what has been revealed or learned these past few weeks. Delta have created a stinking, noxious mess : on the ground, in the Yaldhurst Community, in the Courts and with Dunedin Public Funds. They are so desperate they will consider ANY plan to attempt to redeem the poisoned fruits of their past stupidity, legal or illegal. Your correspondent thinks that Dunedin City Council should urgently seek a legal opinion on the constructive fraud issue noted above. A genuine, objective, legal opinion far from Dunedin, Christchurch or the South Island, from a respected practitioner. And make it public. If the review confirms your correspondent’s post, then don’t wait for the court case. Get rid of the board, Mr Coburn, and Mr Cameron. Am not surprised by Delta CEO’s comment that Delta won’t be going into the subdivision business again. But I wonder how much confidence any buyer would have in a subdivision which Delta had worked on. See post – 24.2.16 Delta #EpicFail —Noble Subdivision: Cameron, Crombie and McKenzie for reportage by NBR’s Suze Metherell, ‘Apple Fields’ directors fined $30,000 over filing omissions (Mon, 25 May 2015). There is only one way that this whole mess will be resolved and that is via the Courts, but its more than abundantly clear from what has been posted that Delta, DCHL and the DCC have known, and do know, of this fiasco and HAVE NOT REPORTED it as required to the eventual people who have to suffer the financial loss – the ratepayers of Dunedin. Viewing the video of the last full Council meeting it is now more than obvious that when detail was being asked to be revealed that Cull, through his immediate high-handed shut down of questions, and knowing that Delta, DCHL and the Mayor had been fully and regularly briefed for a considerable time, that the detail of this fiasco has been known for a considerable time. It is also obvious that this mess has been obscured from view – presumably to protect the stupid. It seems that the OAG can’t be bothered to even acknowledge receipt of emails that have been sent to them so they probably will do nothing despite having responsibility for quality of financial reporting. And what of the ODT’s and other MSM interest in a series of financial blunders all funded by hapless ratepayers? Time for more strident action Dunedin? Its very hard to find any winners in the Noble Investments subdivision at Yaldhurst. All of the above funded by the ratepayers of Dunedin. And one name continues to be mentioned, a former director of Delta, Jacks Point and associate of the director of Luggate. Now mentioned by CD as “running around with respect of the Noble subdivision”. Can the law of New Zealand not bring action in the courts to examine the huge losses (well in excess of $40 million) by Dunedin ratepayers as a result of these crazy Delta investments all connected with one individual? How much disappearance or theft of public moneys does it take for authorities to act. We can see a high court action by the government designed to ensure directors sign off accounts, but we cannot get an investigation into corruption, incompetence and possible conspiracy in the matter of losses in excess of $40 million! Gold Band Finance seems to have done okay. Wonder if Delta was paying Gold Band Finance interest and, if so, at what rate. Diane, Gold Band finance have a paper profit. There won’t be any cash winners at Yaldhurst. Maybe the final landowners, but even they have a huge potential liability in rebuilding stormwater and roading infrastructure. Gold Band have made a real actual profit of about a million. They lent NIL $1.75M and got paid $2.7M for two thirds of it in 2013 from Delta and Avanti. They are further in line to get another huge gain of around $3M if paid in full. I hate working out compounding interest and I don’t know when Gold Band first lent this money. But this looks like an extraordinarily good rate of return and kind of what you would expect if they lend money, as they say online, at rates ranging from 13.00% to 21.95%. Makes me wonder why anyone would borrow money from them. Actually probably a greater profit in lending money at these rates than there is likely to be in building a subdivision! Gurglars: I thought Gold Band were able to sell their mortgage to Delta for more than it was really worth because Delta kept working on the subdivision after serious indications that they should stop. To me, that sounds like real money transferred from Delta (and ultimately Dunedin ratepayers) to Gold Band. But please explain this to me if I am misunderstanding these complicated machinations. I was thinking of the old scam of stealing the pennies while everyone is paying attention to the pounds. This was one of the earliest computer frauds where someone wrote a programme tweaking a very large computerized payroll system so that all the fractions of cents in people’s wages and salary calculations went into the scammer’s bank account. No-one noticed, or even knew, when 0.25c, for example, was missing from their pay packet but the amount accumulated to a significant amount for the scammer. So, along similar lines, if you have a subdivision where people are talking about maybe $30 million(? – no idea of the estimated total value involved at Yaldhurst), the odd million dollars or even half a million, may not seem very significant. But it sure is significant to someone who might get the chance to pocket it! Chris Hutching, Court ruling lifts lid on Delta’s woes – published Friday March 4, 2016. It really like puzzles and this is certainly a very interesting one. Diane, NBR’s in it to make money. I’m not sure ODT is any sort of competitor given the appalling lack of business reporting, investigative analysis and overall editorial standards for business coverage displayed by ODT and Allied Press Ltd publishing outlets generally. In actual fact NBR’s weekly print edition is available (rates funded) to all DCC residents and visitors via our public libraries. Not sure if NBR Online is available to view at Libraries. Haven’t looked. If NBR is on the right track and Delta did give their ‘client’, Noble Investments Ltd, credit, then Dunedin City Holdings Ltd Chair, Graham Crombie is mistaken and Delta WAS investing in property. In fact, it could be worse than that. Under such circumstances, Delta wouldn’t have been ‘investing’ in property: they would have been speculating. And Diane if Gold Band investments actually loaned the money to Noble Investments then only repayment can be profitable to them. The other alternative is that Gold Band is a schonk and Delta is the only lender/loser. I’d be very surprised if any entity involved came out of a completely failed debacle like this with a zac. Larks! 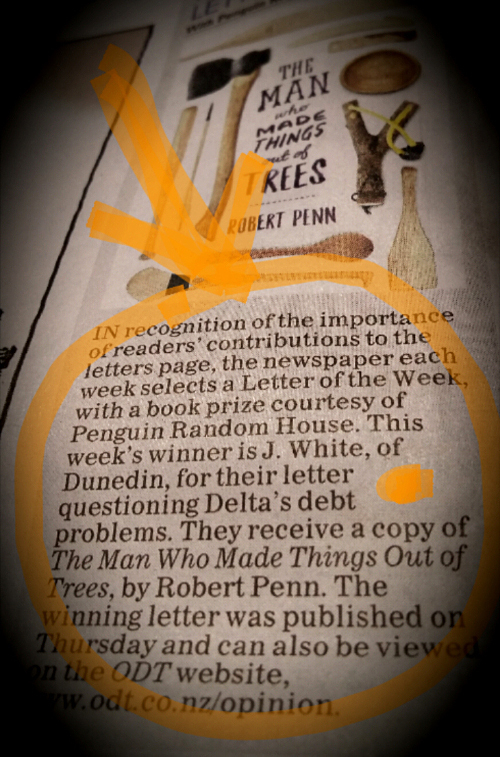 ODT’s Letter of the Week contains a teeny surprise – the letter was featured at another post. Ultra subtle. Gurglars, the first mortgage is now owned three ways by Delta, and Gold Band. They will all do well. Remember Delta bought a share of the Gold Band mortgage in 2013, of $2.7M. There isn’t much doubt that all the first mortgage holders will make big profits, in the form of their default and penalty interest. Gold Band have already profited very nicely as Diane says. The value of the raw land will protect the shared first mortgage holders. It is all the other security holders, including Delta second mortgages and unsecured debt as far and away the biggest, that are facing a haircut (haircut : financier call talk for getting partial or no payment). Video cameras in the student quarter to keep the high-spirited young people straight. It may now also be helpful to bug golf courses to keep the money men on the straight and narrow. Elizabeth, my understanding is that due to the caveats, road and stormwater stuffups that the value of the land may not recover first mortgage securities. Only time will tell. For a white knight to come along and purchase the bare land, they would have to go through a much scrutinised consent regime. The CCC will have every bush lawyer on the watch for the next series of council shenanigans. And who is funding the court action? Gurglars. CCC is in bed with the developer NIL. NIL and CCC staff agreed behind-closed-doors to the construction of the grossly non-complying roads without legal consent “at the developers risk” and to the unfeasible stormwater. NIL made it clear in public council meetings that it would sue CCC for letting it build the narrow roads to the widths NIL pressured them into. (NIL’s agent also suggested NIL could sue Delta for constructing the roads to the non-complying standards they instructed Delta to build them to without consent). NIL and Apple Fields are notorious litigators and Councillors have stated in public meetings they fear getting sued by them. CCC continue to oppress the legal rights of the affected parties and public and are set on consenting anything non-complying that NIL requests, non-notified. It’s not like defying orders during war-time, and the excuse “I was only following orders” fell over a long time ago at Nuremberg. Punishment for disobedience was much more serious, possibly fatal depending on how rabid the (armed, mind you!) “superior officer” was. What Colin says makes sense to me – with one proviso: it may not be the Christchurch City Council which is in bed with the developers (the official developers, that is – Noble Investments Ltd, which seems have been deemed near enough to being a subsidiary of Apple Fields.) It may be just one or two bad eggs working for the CCC who are not bothered about conflict of interest verbal agreements concerning ‘retrospective’ consents or about signing things off when they are not really complying. People who say things like, “Don’t worry about that. I’ll fix it for you.” After all, if you can bury the evidence, who’s going to know? Subdivisions which cut corners on drainage etc are far from uncommon, as nearby landowners can find out much later to their disadvantage. And land which already has various planning consents is often offered for sale at a higher price because of the consents. It’s hard to understand why Delta management instructed those on the ground to continue when it seemed that they thought they should stop because the work was non-complying. Unless the Delta management has been perhaps misled by someone working for the CCC. Then Delta management’s apparently strange decision-making might very well make sense. And perhaps the Christchurch City Council might do well to take a leaf out of the Dunedin City Council’s book and upgrade its staff conflict of interest policy and scrutiny. It doesn’t surprise me to read that Apple Fields likes going to court because as soon as I read about the provision for sections being sold back to someone or other for $10, I thought that they sounded as if they liked tricky stuff. I can’t see any reason to make an agreement to sell a section for $10 (a nominal value) except to make the transaction look like a land purchase when it isn’t as simple, or as clear-cut, as that. If a council controlled company like Delta is going to be managed prudently then I think they should be more careful of the company they keep. Gold Band Finance look like loan sharks to me and Apple Fields seems to like tying people up in legal and financial knots when it does land development, not taking a straightforward approach at all. And the developer also sues the consent authority for not stopping the contractor from carrying out the non-complying work (after having first had plausible private talks with the consent authority, asking them to turn a blind eye, saying that the final outcome will be good for everyone and do no harm.) So maybe this developer was planning all along to make more money out of suckering people than out of the project. So, what part is The Press playing in making sure that the whole mess is made public? Surely it is evident to anyone that takes a look that the roads are non-complying and in all likelihood the sizes of the stormwater pipes etc have been photographed etc. As far as I’m aware the whole subdivision is under the path of high tension power lines as well – not a lot of appeal. I’d be surprised if there isn’t informal photographic record of the entire site, the question is how to access it. Backgrounds of selfies, workers who were uneasy about what they were having to do and kept a record of eg pipe sizes? Perhaps someone reading this knows of relevant facebook pages or other social media? The as built plans are public record. CCC now accept the roads and stormwater infrastructure is inadequate and needs remedying before any infrastructure can vest and s224 titles can issue. NIL’s stormwater designer Cardno have also accepted this in writing despite previous affidavits to the contrary in High Court proceedings. How high is the bar set for contempt of court and perjury, and is demonstration that one has been lying through one’s teeth relevant in any way : “despite previous affidavits to the contrary in High Court proceedings”? The Press are doing nothing about exposing this mess. They have been hoodwinked (or scared) by NIL/AFL, as have CCC, Delta, DCHL, DCC, NZTA etc. The Press have been suckered in by NIL (and maybe CCC) that residents are trying to extort roads and services out of them that NIL are not obligated to provide. The facts in black and white, and signed by NIL’s agents, is irrefutable that NIL owe roads and services at its cost. They were due in 2008 (2 years after the rezoning). The only extortion is that of NIL to residents that if they didn’t remove their caveat protection NIL would sue them for tens of millions and destroy them. Sorry to read of Tom Kains passing. He certainly looked the business and was full of confidence but his entrepreneurial activities never added value for his hapless investors. The legal sector will certainly miss him. Some people have never heard of ‘de-escalation’. Or look for win-win solutions. A much better way to do business, I think. And life, for that matter. Goodness! A world I hardly knew existed. No wonder people in the lower South Island are tiptoe-ing around this debacle. More about the history of Apple Fields. De facto urban planners for the Christchurch region one way or another it seems. Or wanted to be and had the land to make it a possibility.